series. Courtesy of the artist and Jack Shainman Gallery. Artspace is working with New Haven-based painter Titus Kaphar to develop the historical, curatorial and educational portions of this exhibition. Visitors will encounter a timeline of the history of racial violence in America that begins in the 1700s and focuses on events that took place in New Haven. 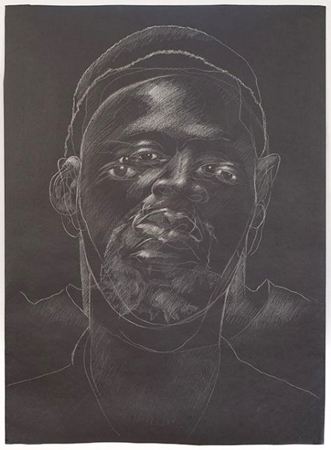 Kaphar’s series of chalk on blackboard drawings from The Jerome Project sparked the idea for the numbers-driven framework of the show. This project started when a search for his father in the U.S. prison system turned up 99 incarcerated African-American men with the same first and last name. Those Federal Registry images put in stark relief the racial bias in our judicial system, giving visual form to the notion that the sentencing policies over the past 40 years have transformed the nation’s prison system into a modern equivalent of Jim Crow. In an attempt to make sense of these images, he painted each of the mug shots in the Byzantine icon style of Saint Jerome. The works in Arresting Patterns similarly demonstrate how artworks might act as surrogates for standard data visualization charts and graphs. A companion exhibition displays the work of local high school students who collaborated with Kaphar and the Collective Consciousness Theater to create new work inspired by The Jerome Project. The exhibition includes a reading room with texts, essays and archival clippings on the impact of the criminal stereotype on prisoners, their families and entire communities. A related two-day conference at the Yale University Art Gallery takes place Saturday, September 12 and Sunday, September 13, 2015. Support is provided by the Surdna Foundation’s new Artists Engaging in Social Change initiative, the Seymour Lustman Fund, JANA and Andy Warhol Foundations, Friends of Artspace, and other generous funders listed below.